Stepping outside the box: The Poisoner’s Handbook. We all have a particular genre we’re magnetically drawn to. For me, it’s mysteries. For others it’s romance. And for more others it’s historical. Then there’s the whole Amish thing. ;) No matter what it is, we’ve all got a particular type of book we go for right away, but do you ever step outside that box? 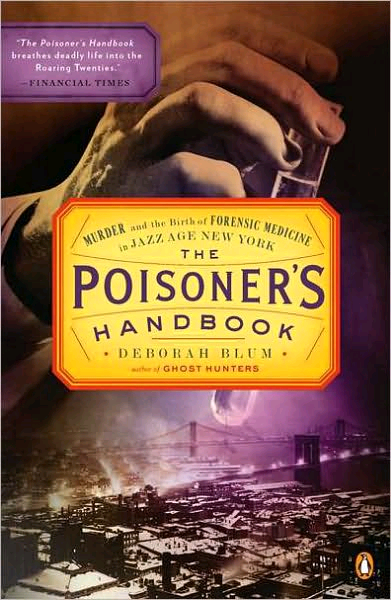 The Poisner’s Handbook: Murder and the Birth of Forensic Medicine in the Jazz Era. Okay, yes, the word “murder” drew me right away. I was ready for a good mystery and the cover was so vintage. What I got was actually the history of science, chemistry, and the development of the criminal investigation process wrapped up in one fascinating true case study after another. Now, I know you might be thinking this has to do with crime so it’s still within in my box. To which I might reply, I can’t even begin to tell you how far a jump it is from the cottage crimes of Christie to the chemical break down of chloroform, the development of radium, and how bootleg whiskey was used by the Nazi’s to create neurotoxins. Seriously, I read a book detailing chemical formulas and I understood it!…Well, at least while I was reading the book. The real gem, of course, was the true stories. So, have you stepped out of your book box recently? Ever? At least once? If not, you might want to give a shot. Just a quick note: I thought I should mention that, while I wouldn’t say The Poisner’s Handbook is gratuitous in any way, there is some straight to the point removing and mincing of brain matter, a few unpleasant crime scene and experiments and a quick autopsied overview. < Previous So, are eBooks taking over the world? Next > What Were You Expecting?